Fifth in a series of blog posts about the songs on my new CD, Distorted Vision. The novel Ender’s Game got me back into reading science fiction after a long hiatus. 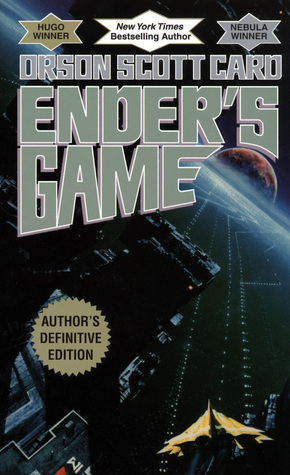 When I was a mid-grade captain in the USAF, stationed at Vandenberg AFB, one of the lieutenants in our unit suggested I read Ender’s Game. For several years almost all of my off-duty reading had been either school- or military-related, and I did little pleasure reading despite having been an avid science fiction reader before college. Reading Ender’s Game, I realized what I had been missing. I still had other reading to do, but gradually I added more science fiction and fantasy to my off-duty reading. My wife and I began reading some SF&F classics to one another on long trips — Starship Troopers on one trip, for instance, and then when our children were old enough that they would listen we read The Hobbit, The Lord of the Rings, and the Harry Potter novels. Gradually I also added more Orson Scott Card novels to my shelves. I don’t remember how long it was before I realized that I had first encountered his fiction in Omni magazine, back when I had been one of that magazine’s earliest subscribers. In 2003 I attended OSC’s writing workshop at UNC-Greensboro, where I found out a lot of what I had done wrong in that first novel. Then in 2004 he selected me as one of the students for his Literary Boot Camp, held that year at Southern Virginia University in Buena Vista, Virginia. I learned so much during that week that I still haven’t put into practice, but I have seen some small success with my short fiction since selling my first story in 2007 and making my first “professional” sale in 2010. Anyway, in the song I wanted a martial beat to capture the battle feel and I tried to compose words that would reflect the difficulties of fighting an implacable enemy in order to protect those we hold dear. And in the final chorus, I change the focus from the determination we must have to face the enemy to the price we pay in doing so. If I’d been more forward-thinking, I would have written and released the song to coincide with the release of the movie. But my sense of timing has never been that good. Anyway, whether you’ve read Ender’s Game (or seen the movie) or not, and even if you can’t relate to the feelings expressed in the song, I hope you like “The Enemy’s Gate is Down”! One final note: Both the first chorus and the second chorus include subtle, if not downright obscure, homages to renowned science fiction authors. Can you pick them out? 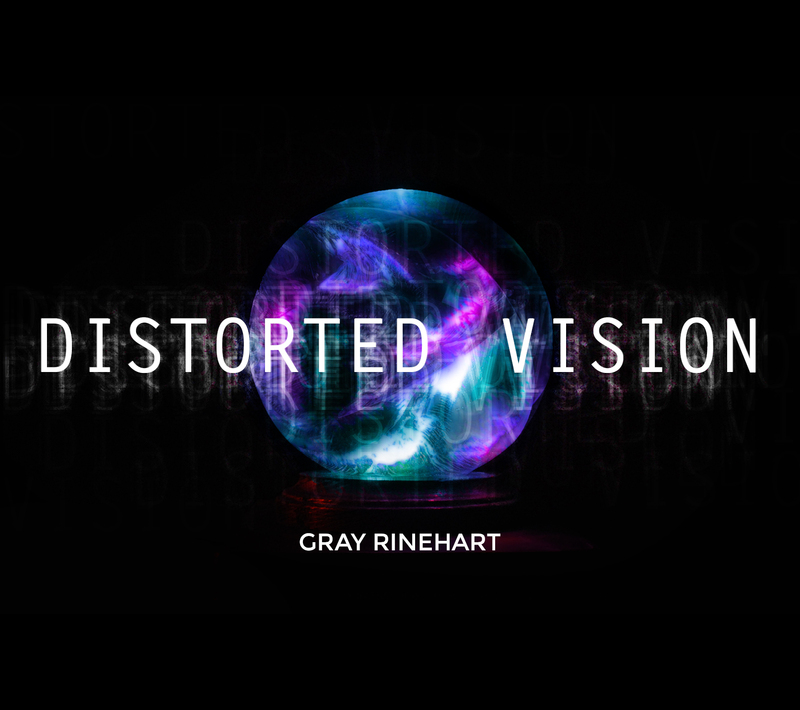 Second in a series of blog posts about the songs on my new CD, Distorted Vision. 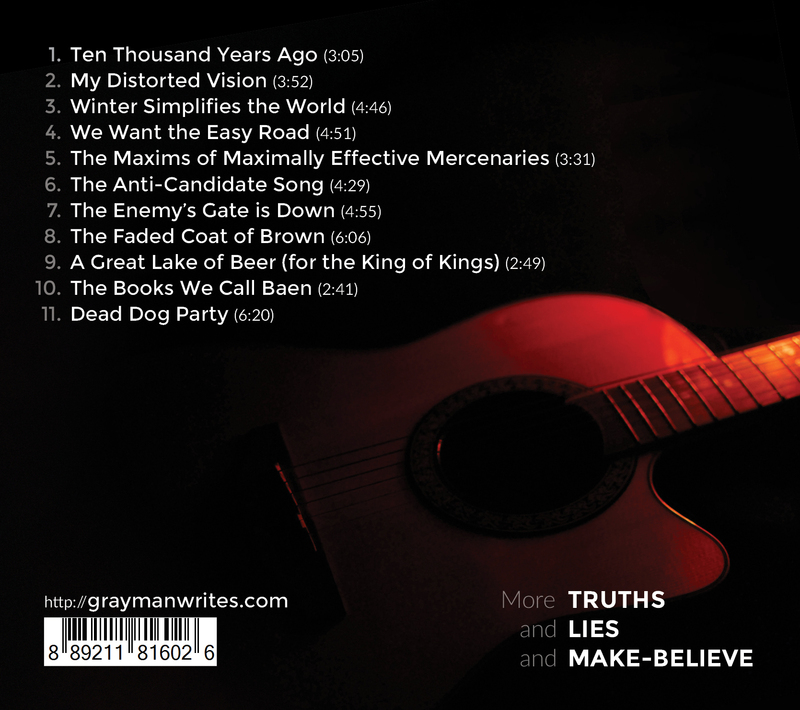 Shortly after I finished up my first album I started writing a tribute song about Baen Books. I’ve been quite pleased to work as a Contributing Editor for Baen for many years now, and I’m equally pleased to include this song on my new album. The difficulty came when I started trying to fit the names of various authors into the chorus. If perhaps you don’t recognize all the authors’ names in the chorus, they’re David Weber, David Drake, John Ringo, Larry Correia, Lois McMaster Bujold, Mercedes Lackey, Eric Flint, Tom Kratman, Wen Spencer, and Mark Van Name. It was a fun challenge, though, and I like the way it turned out! In the negative space of the plume of that launching spaceship, you’ll see the profile of a dragon. Thus the logo itself captures both the science fiction and fantasy sides of the publishing house. Using an existing tune caused me some additional problems. Since I hadn’t written a parody of the original song, I needed to get permission to record the new song, and that proved to be quite the adventure. “The Hero of Canton” was written by Firefly producer Ben Edlund, and I tried several different avenues of trying to get in touch with him — trying to send a message via the man who played Jayne, Adam Baldwin, for instance, and asking Sean Maher (who played Simon Tam) when I saw him at MystiCon in Roanoke. I began to despair of success, but in May I finally achieved a breakthrough in contact. Even though Mr. Edlund said he wasn’t completely sure he could grant me the right to record it, he gave his blessing to the effort — and that was enough for me. My first version of the song included an extended ending chorus with the names of additional authors, but between the time I wrote it and the time I was recording the song we added several new authors to the Baen family — and since some of them were friends of mine, I didn’t want to leave them out! So began a quick rewrite of that extended chorus in order to shoehorn more names in. I know I still left out some authors — I hate to think how long the song would be if I tried to include every author in our catalog — but the final chorus now mentions Chuck Gannon, Dave Freer, Michael Z. Williamson, Frank Chadwick, Ben Bova, Sarah Hoyt, Ryk Spoor, Tony Daniel, Sharon Lee, Steve Miller, Jody Lynn Nye, David B. Coe, Steve White, Brad Torgersen, Catherine Asaro, Timothy Zahn, Travis Taylor, Elizabeth Moon, Robert Buettner, Mike Resnick, Eric James Stone, Steve Stirling, John Lambshead, Les Johnson, Anne McCaffrey, Jerry Pournelle, Andre Norton, Larry Niven, Harry Turtledove, and Robert A. Heinlein. And even though I mostly only mention their last names, that’s still a lot of syllables to put together! As you might imagine, there are a few “in jokes” in the song, but even if you have no idea who Joe Buckley is or what an eARC is, I hope you’ll smile and sing along to “The Books We Call Baen”! Reminder: I’m playing a concert as part of the Dragon Con Filk Track, this Sunday the 6th of September at 4 p.m. in the Hyatt Regency’s Baker Room. Come out and see me! It’s almost Labor Day weekend, and that means I’ll be heading to Atlanta for another Dragon Con! I look forward to a nice, quiet, relaxing time … with about 60 or 70 thousand of my closest friends! 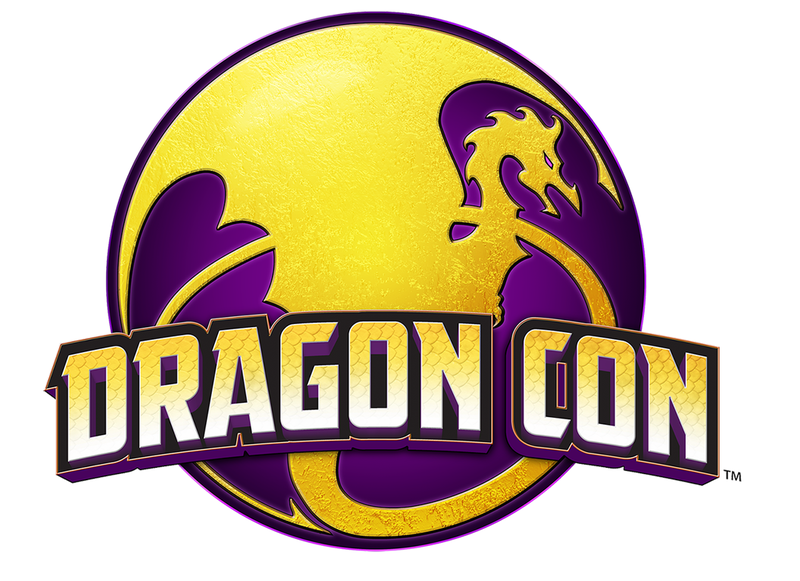 Actually, since Dragon Con is (so far as I know) the largest general science fiction and fantasy convention in the Southeast, I’m sure it will be its typical exciting, exhausting but ultimately rewarding time. I’m particularly grateful to my friend Alethea Kontis and the folks on the Dragon Con Filk Track who have invited me to perform at various times through the weekend. That’s right: as soon as the Baen Road Show is over, I’ll be giving a concert featuring music from my new CD, Distorted Vision, as well as favorites from Truths and Lies and Make-Believe — and more! I plan to have CDs with me wherever I go, as well as “Anti-Candidate,” “Another Romulan Ale” and “Tauntauns to Glory” bumper stickers, so flag me down if you want one! If you’re going, I hope we’ll get a chance to chat. 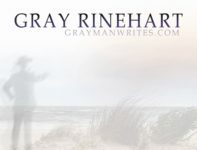 If you’re not going, or if we simply don’t find each other, you can always sign up for my newsletter to get the latest info on my different projects. Have fun storming the convention! The photography and cover design are by my son, Christopher Rinehart. The album was recorded at Stormghost Studio, Cary, NC, and MKM Studios, Scarborough, ME; engineered and mixed by Mark Minervino at MKM Studios, Scarborough, ME; and mastered by Brian Ceccarelli at Talus Music, Apex, NC. I’ll be releasing the electronic album later this week, and physical CDs will be available shortly thereafter. Are you going to the convention this weekend? I am. Not too long after posting this, in fact. ConCarolinas is always a great convention — “science fiction, Carolina style” — and this year it’s moved into a new facility in Concord (just north of Charlotte). My schedule on Friday is wide open, so after I set up my merchandise table I plan to drop in on a panel or two and eventually join the filk circle! 5:30 p.m. Panel — What’s An Award Worth? 4:00 p.m. Panel — Do I Need A Writing Group? If you’re going to the con, stop by and see me! I’ll tell you whatever you want to know about my new album, Distorted Vision, coming out this summer; you can sign up for my newsletter to get the latest info; you can snag a copy of my InterGalactic Medicine Show story, “Ashes to Ashes, Dust to Dust, Earth to Alluvium”; and of course you can also pick up a copy of Truths and Lies and Make-Believe as well as “Another Romulan Ale” and “Tauntauns to Glory” bumper stickers. And if you’re not going to the convention, then I hope you have fun this weekend with whatever you get to do! This weekend I’ll be at the RavenCon science fiction and fantasy convention up in Virginia. As always, I will have copies of Truths and Lies and Make-Believe as well as “Another Romulan Ale” and “Tauntauns to Glory” bumper stickers. Stop by and say howdy! 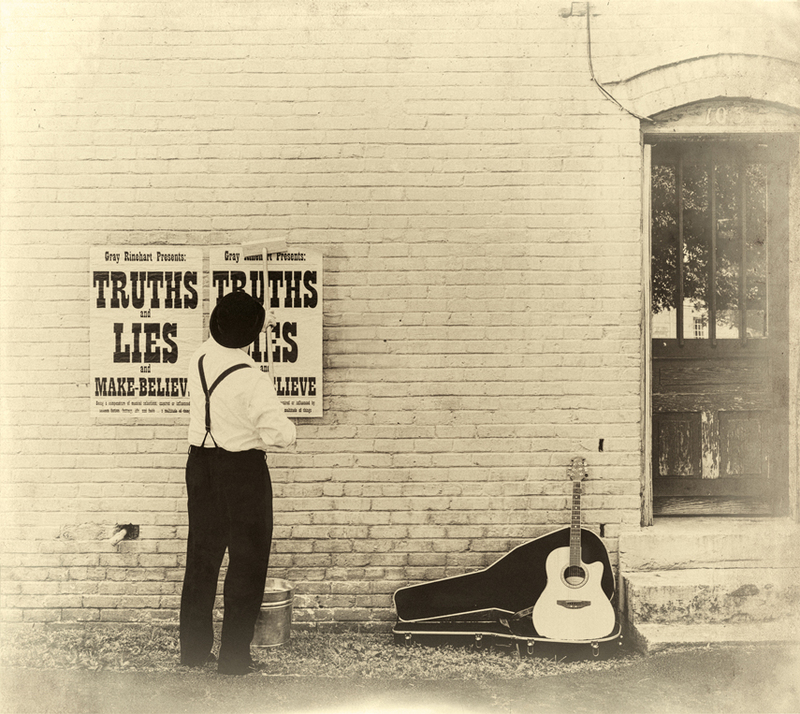 As we’re making progress on my new album, Distorted Vision — about which I’ll have more to say in the future — I thought some folks might be interested to see how the cover of Truths and Lies and Make-Believe came about. Just as I could not have recorded the album by myself, I could not have put the cover together without the help of some very skilled people! I made that image on PowerPoint, using a picture I found on the Internet and the poster idea I’d first used in flyers for the album. I wanted an old-timey feel to it, and something about the idea of putting up notices appealed to me. Eventually, instead of trying to do two rows of posters I decided to use a single row — primarily because it was less work! With the concept in mind, I drove around town looking for different places where we might stage the scene. I found several candidate walls in wood and cement and brick, and talked to nearby vendors about whether we could put up posters on them. Ultimately I got permission from the Creative Images trophy and sign shop to use the wall and doorway on the side of their building. I went frugal with the posters: I printed them at Staples in a couple of different sizes to see what would work, then had enough printed for the photo shoot. They were printed on white paper that I “antiqued” with tea — specifically, a mix of black tea and some raspberry tea for a little reddish tint. (The tint comes through a little on the color versions of the photos — you can see a few of them on my web site.) To hang the posters, I mixed up batches of wheatpaste from a recipe I found on the web. The original color version of that image, without the “postcard” effect, is one of the backgrounds on my web site. I think it turned out to be a great realization of my original concept. And I very much appreciate everyone who helped make it a reality! You can see all the cover images, inside and outside, on the album’s Bandcamp page. P.S. I adapted this blog post from an article sent previously to my newsletter subscribers. If you’d like to receive my every-so-often newsletter, fill out the form here.